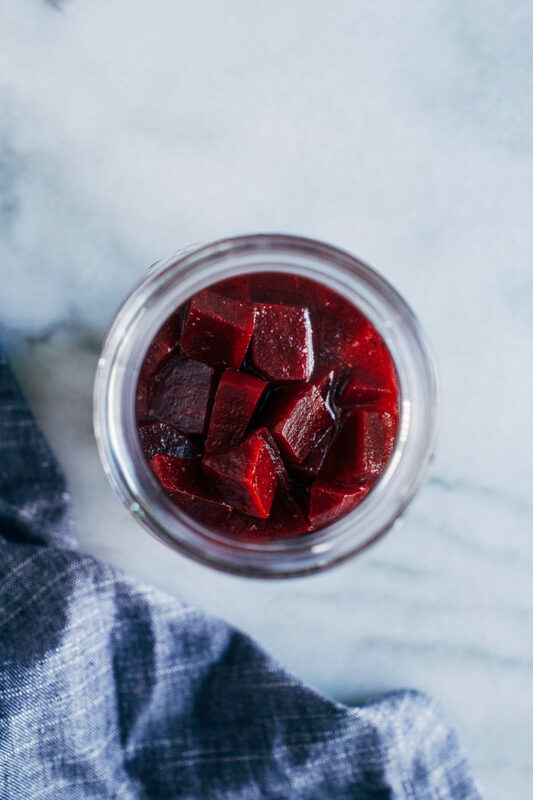 How to Make Pickled Beets- an easy method for making delicious pickled beets to have on hand for healthy salads, bowls, or snacking! Beets kind of have a bad rep for being a pain in the neck to deal with and I’m not here to argue that. Scrubbing them, peeling them, staining your fingernails for days…there’s definitely some truth behind that reputation. But sometimes a little bit of effort pays off, especially when it comes to your health. Beets are a significant source of protective antioxidants, and have also been shown to help reduce blood pressure and improve energy levels. Some athletes even drink beet juice before exercise to help enhance their performance! 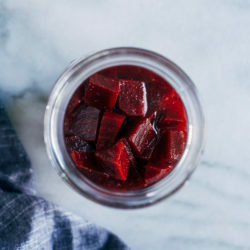 In this case, taking a little bit of time to prepare pickled beets means you have them ready to go in the refrigerator for whenever you’d like them as a healthy topping for salads or bowls. 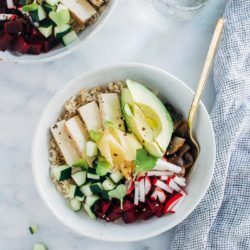 The method I use for this recipe is simply boiling them in a pot of water until they’re soft enough to poke with a fork. Then you can slide the peels right off with your fingers! After that, all you have to do is dice them and place them in a jar with a couple of seasonings and some vinegar. 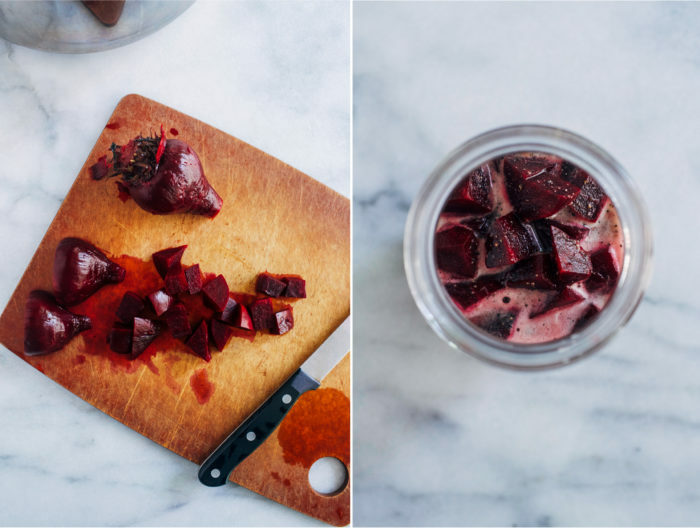 Then a few hours later, you have tangy pickled beets that are ready to eat. I love having pickled beets on hand but the real reason I’m sharing them with you guys is coming tomorrow so be sure to stay tuned! 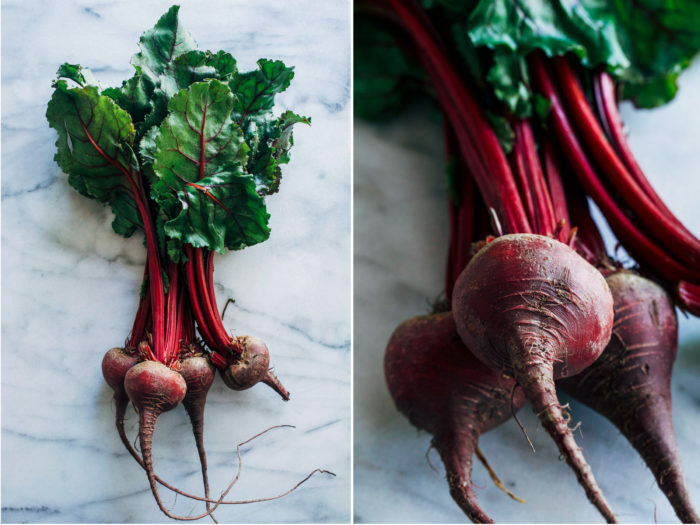 Trim the greens off of the beets, scrub with running water then place in a medium saucepan and cover with water by about an inch. Bring to a boil then lower the heat and simmer for about 25 to 35 minutes, depending on the size of the beets. They are done when soft enough to be easily poked with a fork. Next, drain the beets and rinse them cold water. Use your fingers to gently rub of the skin. Discard the skin then cut the beets into quarters or slices. In a large jar (or bowl with a lid), combine the apple cider vinegar, honey (or agave), olive oil, dry mustard and salt. Place the lid on the jar and shake vigorously. Add the beets to the jar to cover with liquid. Marinate for at least a half hour at room temperature or in the refrigerator overnight. Picked beets will keep for up to 1 week sealed in the refrigerator. I love pickled beets…espically with fresh greens, avocado and pistachios in a salad. 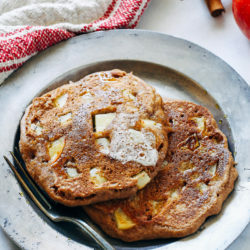 This looks like a simple recipe, too! I loooove beets! I remember the first time I ever tried to juice them, however, and my kitchen looked like a crime scene afterwards lol. I LOVE pickled beets (shocker) and it’s been far too long since I’ve made them. I say bring them on! Can’t wait to see what’s in store for these beauties! Hope you had a fabulous long weekend! Mmmmm I love pickled beets! You’re right — they are a pain to deal with (especially the purple kind) but they’re worth it in the end. 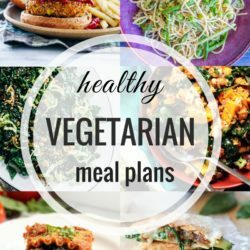 I’m definitely going to try these and I can’t wait to see how you use them! 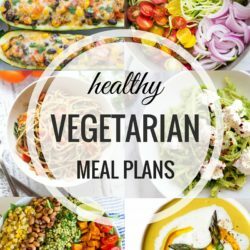 These look perfect to top with salad or grain bowls for meal prep! Plus, I planted beets in our garden for the first time this year too! I’ll have to try this! It sounds weird but beets are one of my favorite foods. 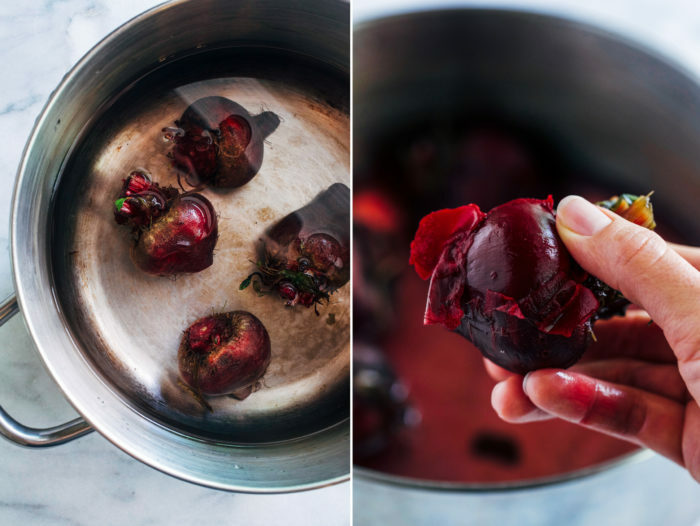 I could seriously eat a whole bunch of roasted beets like candy. Pickled is pretty darn tasty too but I’ve never made my own. I love making pickled beets! I’ll be trying your method tonight, thanks so much for sharing! 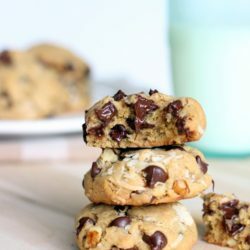 I have made these several times and love this recipe!! I don’t boil the beets I cook in a covered glass casserole dish with an inch or two of water!! 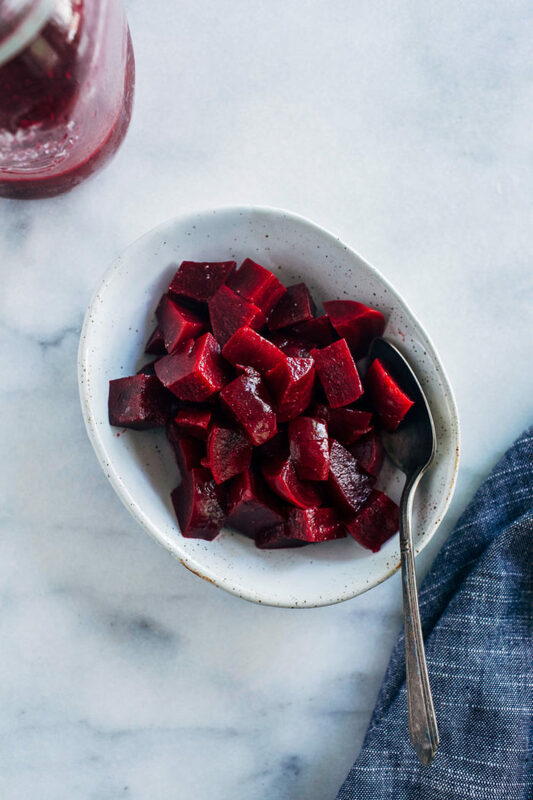 depending on the size of beets it will take 40 min to an hour….check for tenderness and add boiling water if needed partway through cooking. Easy and well worth the effort. Love that tip! Thanks for sharing, Nancy!